Last November 27 of 2017 Alan Freeman who is a Canadian economist co-director of the Geopolitical Economy Research Group  based at the University of Manitoba in Winnipeg, Manitoba, initiated an E-Petition to the Government of Canada. The petition was about lifting all sanctions against Venezuela. The petition was circulated over a period of four months and I personally signed it together with 581 other Canadians. The relatively low number of signatures should not be interpreted as a reflection on the relevance of, and support for the petition, but rather on the novel electronic process used. Any petition introduced in Parliament should be valued by its relevance and content. 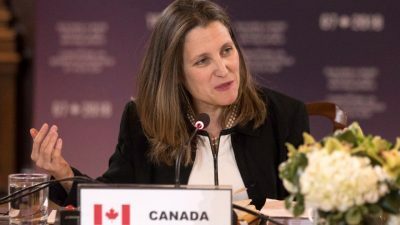 The Minister of Foreign Affairs, Chrystia Freeland, who has been a vocal opponent to the Venezuelan government, signed the Canadian government response. Therefore it was not a surprise to read the same old ideologically motivated arguments against the petition. Canadians find it quite disturbing that the response would start with a worn out statement such as “The promotion of democracy and democratic governance, as well as human rights and the rule of law, lie at the heart of Canada’s values and foreign policy.” This comes precisely at a time when Canadian foreign policy is being openly questioned for Canada’s sale of weapons to Saudi Arabia that is conducting indiscriminate bombings of Yemen. The UN reported that 14 million Yemenis face imminent big famine and the consequent death by starvation of thousands of children. Canada is regarded as being complicit in those crimes. While Canada chooses to speak of the “dire human rights and humanitarian crisis in Venezuela” – where there is none – it ignores, condones and rather endorses Saudi Arabia in the making of one of the worst humanitarian crisis in Yemen. That is the most vicious double standard that a “democratic” country can demonstrate. Many of the arguments in the response to the petition have been questioned and rejected in a long-standing rebuttal to the government’s position on Venezuela in other venues. Likewise Canadians have strongly objected to the absurd serious accusation by the government of Canada against Venezuela of “crimes against humanity”. The Prime Minister of Canada, Justin Trudeau, has taken the unprecedented action of signing a letter to the Prosecutor of the International Criminal Court (ICC) last September 26 requesting an investigation. We can only state again the hypocritical double standard vis-à-vis Canada’s reported involvement in serious crimes in the Middle East.